You’ll want to break out this recipe when you have picky eaters over at your house! I started making this for two of the kids I watch, but I became really fond of the idea of a quick dinner for myself. When Ian has grad school, he doesn’t get home until 11:30pm, so I have to eat alone. As much as I like to cook, I don’t like to make fancy meals for just myself, so I usually end up eating mac and cheese, a smoothie, a salad, or something else really easy. 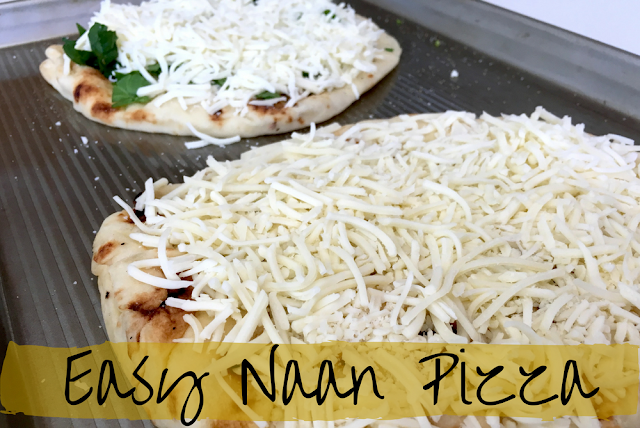 Wanting to switch it up a bit, I grabbed a few frozen pizzas at the grocery store the other week, but realized it wasn’t that healthy for me because they are so processed, so I went shopping again and picked up ingredients for these naan pizzas! Yeah, it’s not the healthiest recipe, but depending on your toppings, you can get in a few servings of vegetables which is always a good thing & since they aren’t as processed as a frozen pizza, you know what is going in your body. It is quick, easy and most importantly, yummy! – 1 naan per person. You can find these in packs at your local grocery store. Step 2: Put your naan on a pan and drizzle with olive oil. Put a handful or two of mozzarella on your naan and add any toppings you would like. Pictured above is just mozzarella and salt on one pizza and spinach, garlic, salt, pepper & chives on the other. YUM. Step 3: Place in the oven for about 10 minutes. You will want to take it out of the oven when your naan starts bubbling up. The crust should be crispy, but the inside should be soft. Enjoy! !